Description: Delicately etched of Solid Brass. A compelling design of Winter Pine Cone and Pine Needles, both elegant and natural representing human enlightenment. 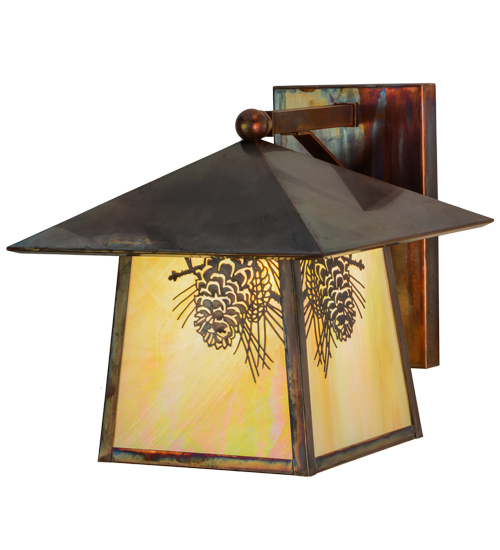 Rustic charm comes alive with soft warm ambient light through stunning Beige Iridescent glass accented by Vintage Copper finished hardware on this nature inspired wall fixture. Perfect for interiors and exteriors. Handcrafted by Meyda artisans in our manufacturing facility at the foothills of the Adirondack Mountains. Custom designs, sizes and colors. Energy efficient lamping options.